A glacier at the base of the towering Olympus Mons volcano on Mars (left) compared to an Antarctic glacier. Deposits in the left image are darkened for emphasis. 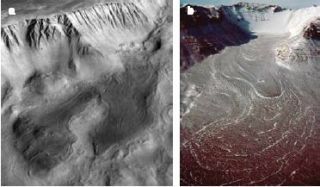 New images of Mars reveal that flowing water, large glaciers and active volcanoes have scoured the planet in recent geologic times. Scientists say Mars has been geologically active in the past few million years -- an eyeblink in the planet's 4.5-billion-year history. Three studies appearing in the March 17 issue of the journal Nature add to a growing body of evidence that points to recent liquid water and present vast stores of underground ice near the planet's equator. Combined, the research provides further impetus to search Mars for signs of life, scientists said. Billions of years ago, Mars was warmer and wetter than today, according to evidence of past water seen by NASA's two Mars rovers currently exploring the planet. Scientists are eager to learn whether water has graced the planet in recent times, because liquid water is a key ingredient for life as we know it. Likewise, if the red planet remains volcanically active, local hot spots could serve as incubators for microbial life, as they do in otherwise desolate places on Earth. No firm evidence for life on Mars has been presented, but in recent months signs of methane in the Martian atmosphere have piqued the curiosity of astrobiologists. The methane could be generated by volcanic activity or mark the signature of subsurface life, but its detection remains controversial nonetheless. In the three new papers, researchers lay out the strongest case yet that volcanism may be ongoing and glacial activity recent. The observations were made by the High Resolution Stereo Camera (HRSC) on the European Space Agency's Mars Express Mission. Explosive eruptions about 350 million years ago created depressions on the flanks of the volcano Hecates Tholus, according to a study led by Ernst Hauber of the German Aerospace Center. And just five million years ago, glacial deposits formed inside these depressions, the scientist concludes. The finding adds to a December study showing five volcanoes on Mars had been active as recently as two million years ago. A group led by geologist James Head of Brown University reanalyzed landforms first thought to be glacial during the Viking missions of the 1970s. Head and his colleagues found the features are indeed evidence of geologically recent glacial activity near the equator. "Mars is very dynamic," according to Head. "We see that the climate change and geological forces that drive evolution on Earth are happening there." Glaciers appear to have moved from the Martian poles to the tropics between 350,000 years ago and 4 million years ago. "This glaciation may be a response to recent changes in the incidence of sunlight induced by variations in obliquity of the planet's spin axis," said Victor Baker, who was not involved in the research. The new studies suggest that Mars is currently in an interglacial period. As the planet tilts closer to the sun, ice near the equator is expected to vaporize. In a third paper, additional detail is provided on a previous announcement of a frozen chunk of water - roughly the size of the North Sea - that formed in the last five million years near the Martian equator. The area is thought to have been flooded by liquid water carried along by volcanic eruptions in a region called Cerberus Fossae. "The three papers provide an overwhelming case for new thinking about recent geological activity on Mars," writes Baker in an analysis of the work. Baker said the findings support a 1991 hypothesis, then considered outrageous, that Mars has experienced episodes of cataclysmic flooding in modern times. Water is thought to have formed temporary seas, but researchers had long assumed it all evaporated into the thin Martian air. Many scientists now agree that much of the water remained. "The evidence from HRSC for recent aqueous activity suggests that the water is still present, as ice on the ground and water deep beneath the surface," Baker said. In early May, Mars Express will deploy a radar instrument that should be able to detect subsurface water and ice several miles down. "Evidence from the latest pictures indicates that the water will surely be there," Baker said. Where there is water, there could be life. Many investigations on Earth have turned up extremophiles -- microbes living in frigid conditions, thriving in extremely salty water, and gathering around volcanic vents. Last month scientists announced the discovery of bacteria that had survived in a state of frozen suspension for 32,000 years. "We're now seeing geological characteristics on Mars that could be related to life," Head said. "But we're a long way from knowing that life does indeed exist. The glacial deposits we studied would be accessible for sampling in future space missions. If we had ice to study, we would know a lot more about climate change on Mars and whether life is a possibility there."